Sonicu differential air pressure monitoring delivers dependable monitoring solutions for virtually any pressure differential application. From strict-tolerance critical-care healthcare and pharmaceutical environments to commercial HVAC filter monitoring, Sonicu wireless technology and cloud-based software platform provide easy deployment; accurate, reliable data; and superior operational visibility throughout an entire enterprise. 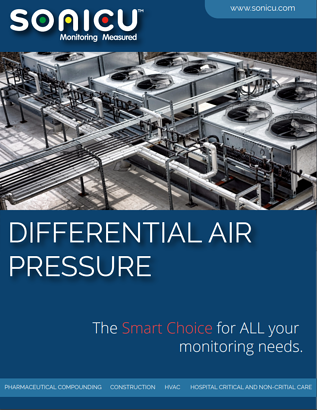 Download our free Differential Air Pressure brochure to discover how wireless, cloud-based pressure differential monitoring improves safety, streamlines regulatory compliance and saves time and money.